The modern espionage thriller is consumed with technology, prioritizing a high-tech surveillance state over the grunt work that used to be a spy’s stock in trade. Today’s Jason Bournes and Jack Bauers are action heroes who don’t have much time for the methodical approach to information gathering found in a Cold War-era John Le Carré novel. When every secret in the world is just a touch screen away, that frees up a lot more time for high-speed car chases and parkour battles. Without their smartphones, drones, and databases, are they really spies at all? The Game creator Toby Whithouse (Being Human) displays obvious affection for the old-school approach in this throwback miniseries set in the early 1970s. Whithouse’s MI5 and KGB spies contact their operatives through classified newspaper ads and dead-drop mailboxes. They take pictures of handwritten diaries and develop the film in darkrooms. They plant bugs in hotel room lamps and shower heads and secretly record conversations on reel-to-reel tape. There’s no Google, Bing, or even Alta Vista. The Game’s low-tech approach is a big part of its charm, but its retro characterizations are more of a drawback. 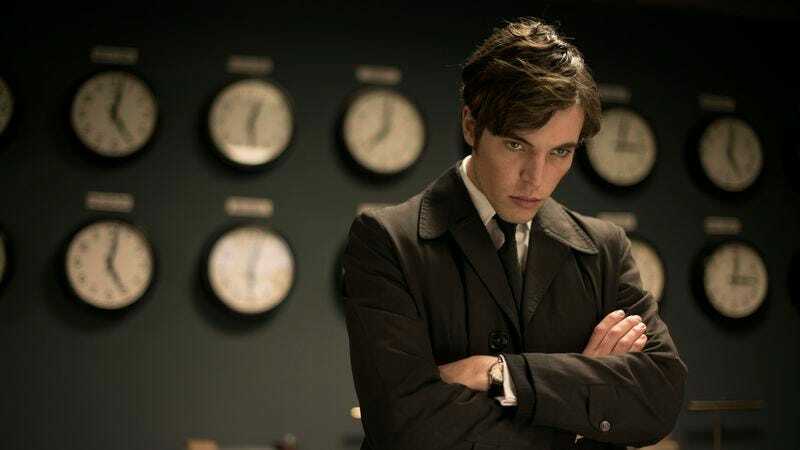 Joe Lambe (Tom Hughes) is an MI5 operative we meet in 1971 Poland under mysterious circumstances. Lambe is escorting a woman to a meeting on the beach with a team of KGB agents. Lambe offers himself up as a defector, but it soon becomes clear he’s walked into a trap. The woman is shot and presumably killed (although it’s hard to take anything at face value in a spy narrative), and Lambe is captured and traded back to MI5 in exchange for three enemy agents. Was Lambe genuinely intending to defect in order to be with the woman, or was he a double agent pretending to defect in order to spread disinformation? That’s just one of the mysteries teased out in the first of the miniseries’ six episodes. The action picks up a year later with Lambe back in London, where he interrogates a potential defector who has vague information about Operation Glass, a Soviet mission set to take place on U.K. soil. Teamed with London police liaison Jim Fenchurch (Shaun Dooley), Lambe attempts to uncover the conspiracy while simultaneously seeking vengeance on the KGB operative who betrayed him in Poland. The first episode offers more than enough intrigue to hook fans of spy thrillers, even if some of the elements are eye-rollingly familiar. (Any viewers with a season or two of 24 under their belt will shudder with recognition when a member of the MI5 team assigned to Operation Glass suggests there may be a mole in the room.) Stylistically, there’s little to complain about. Director Niall MacCormick and cinematographer Urszula Pontikos work in the muted, almost drab tones associated with gritty ’70s thrillers, and the score by Daniel Pemberton has a Henry Mancini-esque retro-spy appeal. A closed-down amusement park, its attractions shrouded in plastic covering, makes an appropriately creepy setting for a key showdown. The cast is strong, but the writing sometimes lets them down. Hughes, who resembles a slightly less wild-eyed Cillian Murphy, is playing a character meant to be an enigma with unclear loyalties. (The show hammers this idea home when Lambe catches his reflection in a mirror while testing a microphone by reciting the nursery rhyme that begins, “Yesterday upon the stair I met a man who wasn’t there.”) In practice, this means his performance is frustratingly opaque at times, although this is likely a first-episode problem that will resolve itself as the miniseries progresses. Brian Cox is appropriately paternal as “Daddy,” the leader of MI5, who has placed his faith in Lambe despite his potential betrayal. A couple of the supporting characters are more problematic. Bobby Waterhouse (Paul Ritter) is described on the BBC America website as “the career-climbing mummy’s boy with connections to Britain’s high-society, whose private life could ruin him.” That private life isn’t explicitly revealed in the first episode, but it’s easy to guess: Waterhouse is dangerously close to being the sort of caricatured closet case you’d see in a spy thriller that was actually made in the early ’70s. That’s not the fault of Ritter, who gives a wry performance, but here’s hoping shades of gray are soon added to this black-and-white conception. The same goes for Alan Montag (Jonathan Aris), the socially awkward surveillance expert. That’s a trope straight out of Francis Ford Coppola’s The Conversation, but Montag is too broadly drawn by half in the premiere, constantly consulting a list of appropriate workplace discussion topics and making hideously inappropriate jokes. Despite these areas of concern, The Game’s first hour is seductive enough to warrant a season pass, especially since that season is only six episodes and (presumably) closed-ended. Today’s high-tech espionage thrillers have their appeal, but there’s still great pleasure to be mined from good old-fashioned spycraft.